Swedish Meatballs are world famous and you might have tried them at IKEA who is dishing out them cheaply and quickly at their stores all over the world. Meatballs at IKEA are edible and affordable but far from the real deal. If you want to sample Swedish meatballs while in Stockholm you should have a look at Meatballs for the People on Södermalm. Situated at Nytorgsgatan 30, off Folkungatan, which is only an 8 minute walk from Medborgarplatsen Subway Station. If you want to get slightly closer you can take bus no 3 to Renstiernas gata and walk from there. 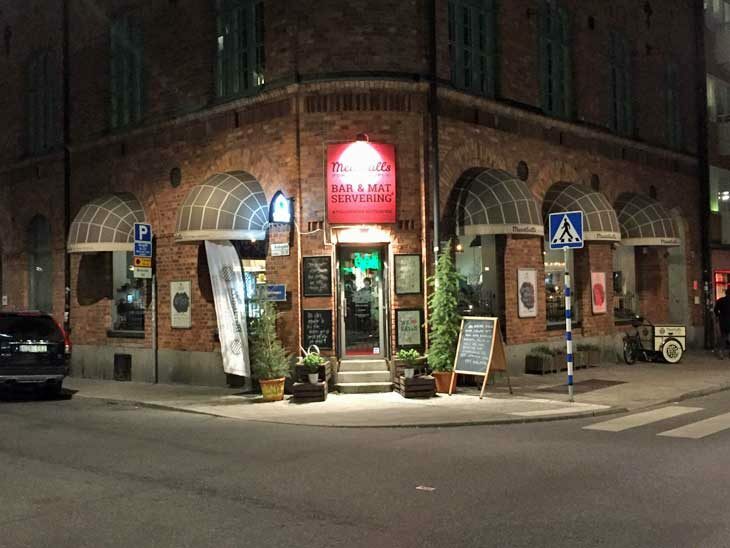 This is not far from Skånegatan and Nytorget where you will find great opportunities for pre or post-dinner drinks at either Skånegatan/Nytorget or Medborgarplatsen. You have almost everything that Södermalm hos to offer within walking distance. Casual and friendly but still professional which is really important if you ask me. Since Swedish meatballs are world famous you will have to expect other foreign visitors, mixed with locals. I would not consider this a tourist trap. You simply choose what kind of dish you want and what you of meatballs you would like to accompany your dish. 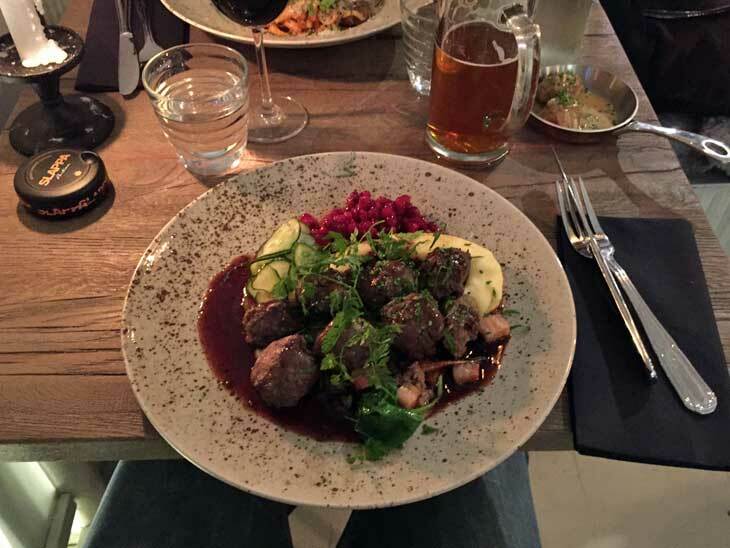 The choices are traditional Swedish Meatballs with potato mash, gravy, pickled cucumber and lingonberries. This is the traditional way of serving meatballs in Sweden. 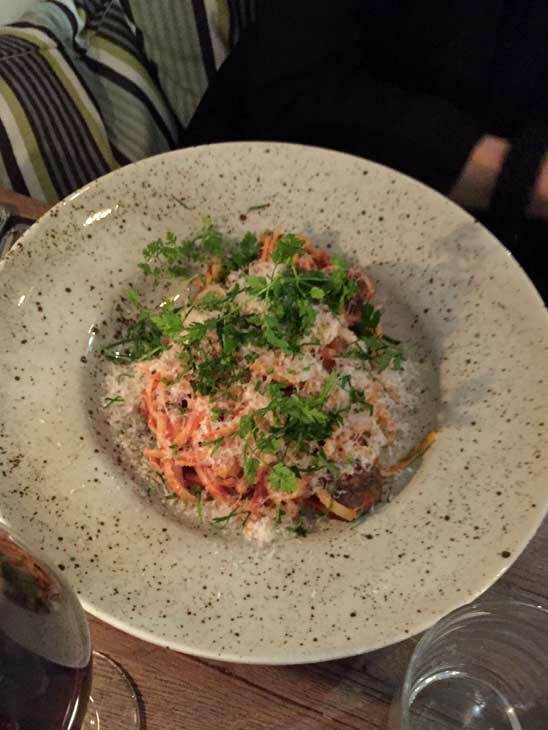 If you are not ready to go Swedish totally, you will have an option of a pasta dish with a bit more international flavours. To be honest, pasta with meatballs can be had anywhere in the world. During my visit, we had a choice of meatballs from turkey, beef or lamb and for an additional 30SEK you will be able to enjoy meatballs made from moose. If you are opting for the pasta you should go for the lamb version since it is a meat with more taste. Meatballs Deluxe at Restaurant Meatballs in Stockholm. I opted for Meatballs Deluxe from moose during my visit and was not disappointed. I enjoyed every moment of our dinner. Deluxe in this case is red wine sauce, chanterelles, bacon and of course lingonberries. Meatballs without lingonberries are not complete. My significant other enjoyed the pasta dish with beef meat balls and her conclusion was “good but not spectacular”. Pasta with meatballs of beef at Restaurant Meatballs in Stockholm. Highly recommended no matter if you are a Swede craving for meatballs or a visitor who want to sample a Swedish specialty.Reservations are recommended, especially during weekends. An extra bonus is that you are on Södermalm which is a cool part of town that is often overlooked by visitors. World´s Longest Commercial Flight Resumes In 2018! Looks good. I can’t believe that I lived right around the corner from this place and never went there! I’ll have to check it out next time. The meatballs are very good and well worth checking out.